Using sunlight, plants and microorganisms take in carbon dioxide and emit oxygen. Those plants are then eaten by animals, which then convert the plants to energy and exhale carbon dioxide. Or if the plants don’t get eaten, they die and decay, putting some carbon in the soil and returning some carbon to the atmosphere. It’s almost a closed loop, though over the course of millions of years, enough decaying plant and animal matter gradually built up in the ground to yield vast reserves of fossil fuels while reducing the carbon dioxide in the atmosphere bit by bit. 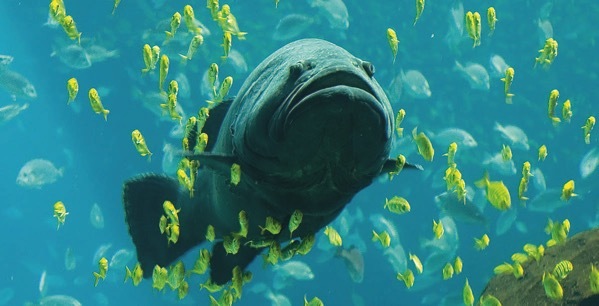 Tropical fish from off northeastern Australia have been spotted around parts of New Zealand, lured across the Tasman Sea by a record-breaking hot summer season. The country’s unusual warmth was largely generated by what meteorologists term a “marine heat wave,” which has seen water temperatures nearly 10 degrees Fahrenheit above normal. The rare appearance of the Queensland groper, also known as the giant grouper, has startled New Zealand divers, who fear the fish won’t survive once temperatures cool to near normal. A controversial study suggests captive dolphins can be as “happy” as those swimming free in the wild, and also appear to look forward to human interaction. French researchers played specific sounds before offering the dolphins different things to do, such as playing with new toys, interacting with a human or being left to do as they pleased. The marine mammals would clearly bob their heads out of the water when they anticipated a human was coming. The scientists conclude this means the dolphins become excited when offered the chance to connect with their human trainers. 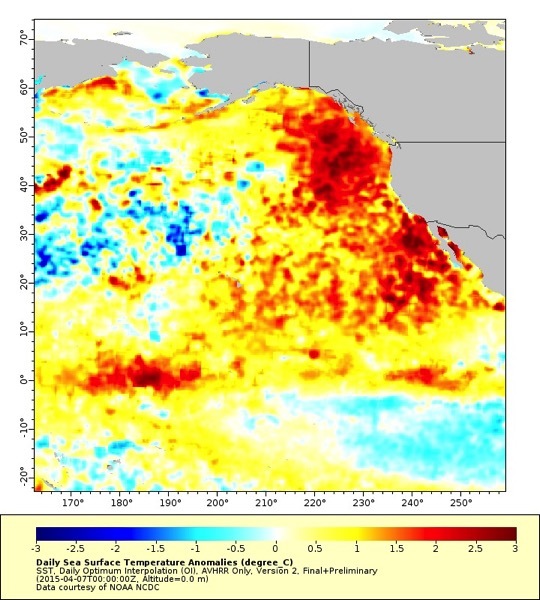 Toxic algae events that are serious enough to merit fishery closures occur off the coasts of Washington and Oregon every three to five years, but the 2015 bloom was the largest by far, according to Ryan McCabe, the study’s lead author and a researcher at the University of Washington’s Joint Institute for the Study of the Atmosphere and Ocean in Seattle. Carbon dioxide emissions hit a record high in 2012, but could have been even higher, according to a new report. The increase in emissions was only 1.1 percent in 2012, compared to an average 2.9 percent over the past decade. The slowdown in emissions growth suggests renewable energy, efficiency and cleaner fuels are having a beneficial effect. A report by PBL Netherlands Environmental Assessment Agency and the European Commission’s Joint Research Centre crunched the numbers for 2012′s carbon dioxide emissions. Although the temperature of the Earth’s atmosphere may have hit the “pause” button recently — with little global warming measured over the past few years — that hasn’t been the case with the oceans. In a study out today in the journal Science, researchers say that the middle depths of a part of the Pacific Ocean have warmed 15 times faster in the past 60 years than they did during the previous 10,000 years. Most of the heat that humanity has put into the atmosphere since the 1970s from greenhouse gas emissions has likely been absorbed by the oceans, according to the most recent report from the Intergovernmental Panel on Climate Change, a United Nations-sponsored group of scientists that issues reports every few years about the effects of global warming. Increases in ocean heat content and temperature are robust indicators of global warming during the past several decades,” according to today’s Science study.